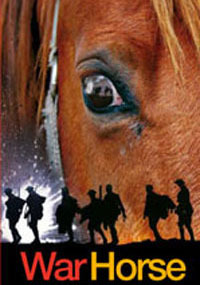 War Horse is now playing at the New London Theatre after its run at the National Theatre. The story takes place during World War I. That may be familiar dramatic territory. But the central character is a horse, and that isn't. Kellie Gutman explores a play which takes animals as seriously as humans. The National Theatre's production of War Horse, an adaptation by Nick Stafford of the 1982 novel by Michael Morpurgo, takes its audience into the heart of the war through the eyes of a horse named Joey. We follow his journey as he is sold to the army and shipped to France, only to end up doing stints on both sides of the war. The former Children’s Laureate, Michael Morpurgo has written more than 100 books for children. He says it was an encounter with an old man in his local pub in Devon that gave him the idea for War Horse. '"I was there in 1916," the old man told me, his eyes filling with tears. "I was there with the horses too." He talked for hours about the horse he'd loved and left behind at the end of the war, how the old horse had been sold off to the French butchers for meat. I determined then and there to tell the story of such a horse. But how to tell it? I had to find a way that didn't take sides,' Murpurgo writes. Anna Phipps in the Independent says the animals are less anthropomorphic in the play than the book, but the play stresses the differences between how animals and humans react to the same situation: horses are incapable of cynicism, they treat both sides equally. 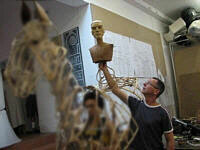 The life-size puppets of horses, produced by the Handspring Puppet Company, are made out of cane, which is bent onto plywood shapes, tied together with twine and covered with translucent fabric. The fully-articulated horses have two interior and one exterior manipulator. Aluminium spinal structures allow them to carry human riders. Due to the translucent coverings, the audience can see the inner workings of the horses on stage. Handspring was started by Basil Jones and Adrian Kohler in 1981, both for artistic reasons and to avoid the South African draft during the Angolan War. Sole owners of businesses could not be drafted, and their plan was to transfer ownership to whomever was currently facing the draft. Though the scheme failed and both were drafted, the puppet company went on. After their return, they used their productions to espouse their anti-Apartheid views. A New York Times story from 1999 gives the details. Michael Morpurgo's other passion is the relationship between children, the environment and sustainability. He was so concerned by the levels of ignorance children had about farm life that he and his wife, Clare, set up 'Farms for City Children’ in 1967. There are now three farms in Devon, Pembrokeshire and Gloucestershire, where school children spend a week at a time living and working on the farms. Here, they learn the most basic of things: where food comes from. 'I felt the spurs biting into my sides and moved up alongside Topthorn as we broke into a trot. Whatsonstage.com shows video footage of the production and interviews with Michael Murpurgo, composer Adrian Sutton, Clare Balding, sports journalist, and members of the audience and cast.